Place the turkey in a roasting tin and sprinkle with the allspice, then coat with the olive oil. Roast for 25-30 mins, until crispy, turning over halfway through the cooking time. Meanwhile, in a small saucepan, mix together the sugar, soy sauce and reserved vinegar and bring to the boil. Stir in the peanut butter, sesame seed oil and chilli powder, and simmer for 2-4 mins, until thick and glossy. Transfer to a serving dish to cool. 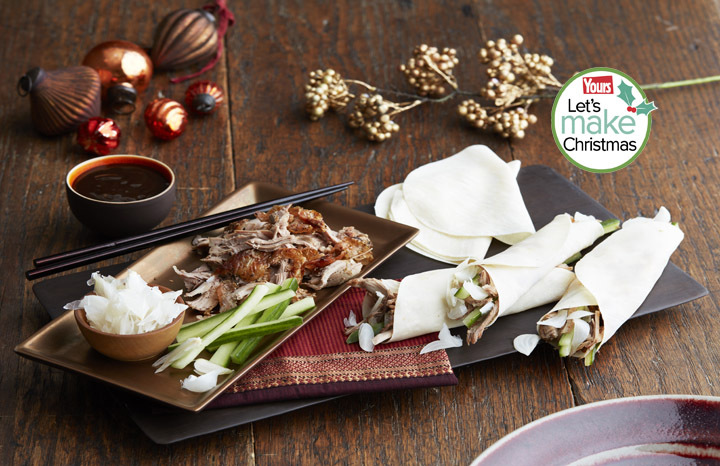 Serve the turkey, along with the shredded onions, cucumber, pancakes and hoisin sauce. Recipe from Haywards Pickled Vegetables.